RetroFitness the low cost leader of high quality fitness franchises is currently seeking single and multi-unit operators looking to expand their franchise portfolios. RetroFitness is a low-cost, high value fitness concept that gives members an unbelievable gym experience for just $19.99 a month. The facility is designed to maximize the square footage so that owners are not paying for space, heat and A/C that goes unused most of the time. We have created a streamline set of operations, so you can be an investor instead of an operator in your club. We've set up Retro University to train the in-club manager so they can oversee the day-to-day operations of the business. RetroFitness has solid unit economics; our top clubs have average gross sales of $1.9 million per unit, and average EBITDA of $749,000; the average club has gross sales of $1.2 million and average EBITDA of $306,000. We've added multiple revenue centers within the facility which helps increase the bottom line. Our RetroFitness clubs have 60-75 pieces of cardio equipment (with personal LCD TV screens), a Retro movie theatre, where members can watch their favorite movies, three different types of circuit training equipment, free weights, locker rooms, personal training, chiropractic services and more. The minimum net worth for individuals seeking a single-unit is $1.5 to $2 million and at least $350,000 in liquid assets. *The minimum net worth for individuals seeking a single-unit is $1.5 to $2 million and at least $350,000 in liquid assets. If you meet or exceed these financial requirements, please complete the RetroFitness Request Form. 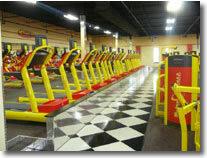 Click on Request Information for FREE info on how to open a Retro Fitness franchise today! Please Note: This Retro Fitness franchise opportunity and other franchise business opportunities, businesses and franchises for sale on this web site are not to be considered as an "offering", "franchise offering", suggestion or recommendation by Franchise Leader™. This advertisement depends entirely on the truthfulness of the information provided by our advertisers which includes, but is not limited to, franchisers, franchise brokers, franchise consultants and business brokers. Franchise Leader™ recommends that you consult a lawyer, financial consultant, accountant or professional advisor before buying a franchise or business opportunity or any type of business. By using this form or any part of our website, you have agreed to all terms and conditions of Franchise Leader™. Please review our Terms & Conditions for more information.